Emergency and critical care veterinarians are specialists with advanced training in emergency medicine. Emergency and critical care veterinarians are board certified to perform emergency procedures and monitor the recovery process. 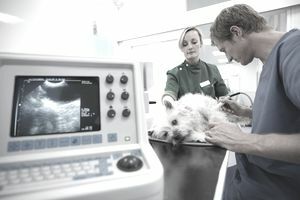 Routine duties for an emergency and critical care veterinarian in private practice include evaluating traumatic injuries, performing surgical procedures, evaluating diagnostic tests, compiling detailed case reports, supervising intensive care units, overseeing veterinary technicians or other support staff, and providing specialty consultations on referral cases. These board-certified veterinary specialists routinely deal with animals that are suffering the effects of physical trauma, shock, respiratory problems, cardiac problems, neurological issues, or other severe injuries that require immediate and intensive veterinary care. Emergency vets may be required to work nights, weekends, and holidays due to the constant need for emergency animal care. Many emergency clinics operate on a 24-hour basis and schedule their vets accordingly. Emergency work brings vets into contact with animals that are under an extremely high level of stress, so it is imperative that proper safety precautions are maintained at all times to minimize the risk of injury to the veterinary staff. Emergency and critical care medicine is one of the many specialties in which veterinarians can achieve board certification. Emergency and critical care vets may choose to narrow their focus further by choosing to work with one particular species or a category of interest such as small animal, large animal, equine, or exotics. Emergency and critical care veterinarians must first be accepted into veterinary school to complete their Doctor of Veterinary Medicine degree. After passing their qualifying exams and becoming licensed to practice medicine, a vet can begin the path of study that will lead to board certification in the specialty field of emergency and critical care. In order to qualify to sit for the board certification exam, a candidate must meet a variety of educational and experiential requirements. The first step is to undertake a 3-year residency in the field under the supervision of a board-certified emergency and critical care diplomate. A variety of hands-on clinical work allows the candidate to complete a checklist of necessary skills and clinical experiences. Residents must also attend seminars and read veterinary literature during their residencies. After the residency has been completed, a vet is eligible to sit for the board certification exam. The exam is administered by the American College of Veterinary Emergency and Critical Care (ACVECC). After successfully completing the exam, a veterinarian is granted diplomate status in the veterinary specialty of emergency and critical care. According to the ACVECC, there were 384 active emergency and critical care diplomats in practice during the December 2011 survey. Diplomates must also meet continuing education requirements each year to maintain their board-certified status. These requirements are fulfilled by attending lectures, participating in labs, and attending specialty related seminars. The continuing education credit requirement ensures that specialists keep abreast of recent advances and innovations in the field. The Bureau of Labor Statistics (BLS) reported a median annual wage of $82,900 for the broader category of all veterinarians in the May 2010 survey. The lowest paid ten percent of all veterinarians earned a salary of less than $50,480 each year while the highest paid ten percent of all veterinarians earned a salary of over $141,680 each year. Board certified specialists tend to be in that top tier of the compensation scale, though the BLS does not separate specific salary data for each of the individual veterinary specialties. Residents do earn a salary while completing their residency requirements, though the level of compensation is much less than the resident would be able to earn in clinical private practice. Residency salaries generally range in the ballpark of $25,000 to $35,000 per year depending on the program. A list of ACVECC approved residencies is available on their website. The Bureau of Labor Statistics (BLS) survey results project that the entire veterinary profession will have a very strong rate of growth, nearly 36 percent, over the decade from 2010 to 2020. This rate of growth for veterinary medicine is much faster than the average for all professions. The extremely difficult nature of the specialty training programs and board certification exams ensure that only a small number of professionals will be successful in their attempts to become board certified. The extremely limited supply of board-certified professionals in the specialty of emergency and critical care will ensure a high demand for diplomats in this field.